Key target reached - well done! How did 12 million letters a week reach WW1 soldiers? Are half the Stewarts in Britain really descended from royalty? Did you take the Ancestry Challenge? Question of the week: "Can a minor be an executor?" The LostCousins newsletter is usually published fortnightly. To access the previous newsletter (dated 22 January 2014) click here, for an index to articles from 2009-10 click here, for a list of articles from 2011 click here and for a list of articles from 2012-13 click here. By the time you read this LostCousins members will have reached a key target - over 5% of all the people recorded on the 1881 England & Wales census (almost 1.3 million out of 25.9 million) will have been entered by one or more LostCousins members on their My Ancestors page. This means that when you enter a relative from that census you've got 1 chance in 20 of getting an immediate match! This was one of the targets I set when starting LostCousins in 2004, so it's great that we've met it before our 10th birthday on 1st May. Now all that remains is to reach the target of 100,000 members by the anniversary. Sadly the progress towards this goal is less impressive. Whilst well over 300 new members have joined since I first mentioned this target in my newsletter on Christmas Eve, we're still over 5000 short. What I find hardest to understand is that in the 6 weeks since then only 12 members (out of the 60,000 who receive this newsletter) have used their My Referrals page to invite one of their cousins to join! LostCousins is all about cousins helping each other. We all have cousins who we've met through other genealogy sites - why not give them the opportunity to find more new cousins and get their own copy of this newsletter? Tip: when you use your My Referrals page to invite a known cousin to join they'll appear on your My Cousins page automatically as soon as they register. TV historian Dan Snow is going to be at Who Do You Think You Are? Live on 20th February - you'll find him on the Imperial War Museums stand upstairs - and on the BBC website there's an interesting article in which he debunks some of the myths (such as "lions led by donkeys") that have grown up around the Great War. A generation whose knowledge of history comes largely from watching Blackadder clearly has a lot to learn! Tip: one lucky visitor to the Show that day is going to win a unique prize - tea with Dan Snow. You'll find all the details here. On Monday of last week I watched the first episode of Britain's Great War in which Jeremy Paxman looks back at the Great War and the effect it had on Britain - I thought it was very interesting. If you missed the first episode it is available on BBC iPlayer here (until 24th February). Was everyone who fought in the Great War a hero? Were all those who stayed behind cowards, worthy of the white feathers handed out by angry women? And what about the German soldiers - were they just like our Tommies, or were the Huns torturers and rapists? My maternal grandfather's paternal grandmother - though born in England - was of German stock, but that wasn't the reason he didn't fight in World War 1 - it was because he was a boiler-maker, work that was absolutely essential to the war effort. By contrast, my paternal grandfather, whose ancestors were farmworkers from Suffolk, was a commercial traveller who sold lace to retailers. However to the best of my knowledge he didn't volunteer in 1914, at the outbreak of war, nor in 1915 when it became clear that the British Army needed all the troops it could muster. He didn't even volunteer when his younger brother was killed at Ypres in January 1916, although to be fair his second child (my father) was due to be born a few months later - it would hardly have been the best time to leave my grandmother, who had been hospitalised for over 6 months after the birth of her first son. But he wasn't the only one - less than half of the men who fought in the Great War volunteered to fight - most were conscripted after the passing of the Military Service Act, 1916, and some of those who volunteered only did so once their conscription became inevitable. 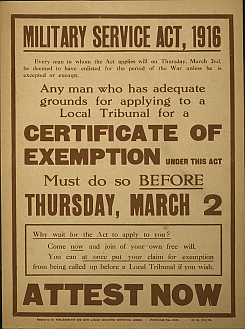 On 2nd March 1916 all single men between the ages of 19 and 41 were deemed to have enlisted unless they had previously obtained an exemption certificate; from 25th May conscription was extended to married men, and before the war ended the upper age limit was raised to 51. At the National Archives website you can view the case files of over 8000 men who appealed to the Middlesex military service appeal tribunal between 1916 and 1918. Middlesex was just one of 83 County Appeal Tribunals which heard cases brought by men who had failed to gain exemption at one of the 2086 local Military Service Tribunals - by October 1916 there were over a million men who had been exempted or who had cases pending. My grandfather may have been one of them - his service records were destroyed in WW2 but it wasn't until January 1917 that he was admitted to the Honourable Artillery Company, and he didn't leave for France until July of that year, by which time the USA had entered the war. Anyone who had volunteered after the outbreak of war, but had been rejected as unfit, was exempt from conscription - but that didn't stop some of them joining up, either because they wanted to or because they were branded as cowards for not being in uniform, as this 2008 article from The Guardian explains. Note: the Middlesex military service appeal tribunal records can be viewed free (although only until 2024). There's a fascinating article on the BBC website written by one of the nicest politicians you could ever hope to meet - ex-postman and former Home Secretary Alan Johnson - which tells how the General Post Office maintained an efficient postal service for soldiers and sailors during the Great War. I found it fascinating, and I suspect you will too! For many years the Scotland censuses were only available online at the pay-per-view Scotlandspeople site, and as a consequence most people with Scottish ancestry have done less research into their collateral lines than those with English, Welsh, Canadian or US ancestry. But now that it's possible to access the census transcriptions free as part of an Ancestry or findmypast subscription, there's no reason why the Scottish branches of your tree shouldn't be as well-researched as your other lines. Remember that, whilst we all start by entering our direct ancestors and their households on our My Ancestors page, in practice it's the members of their extended families who are most likely to link us to our 'lost cousins'. Tip: if you're using findmypast I suggest you first read the article "Interpreting the Scotland 1881 census references at findmypast" which you'll find on the Help & Advice page. Gillian wrote at the weekend to tell me about an excellent free site for those who have ancestors from the Greenock (Renfrewshire) area - the records available online include over 100,000 birth, marriage and death announcements from the Greenock Advertiser, Greenock Telegraph and other local papers. She also mentioned the Ayrshire Roots Index which has similar records from the Ardrossan & Saltcoats Herald. Tip: whilst I haven't read it myself (because I don't have Scottish ancestry) I've been told by a couple of LostCousins members who do that "Reunion. A search for ancestors" is well worth reading. According to an article in the Daily Telegraph last week, half the men in Britain who bear the surname Stewart are descended from Scotland's royal dynasty. I have a feeling that there's a flaw in the argument somewhere, though I haven't yet worked out what it is - perhaps Debbie Kennett, who will be telling us all about DNA at Genealogy in the Sunshine next month, will have the answer? In the meantime I'm going to buy a copy of Genetic Genealogy: The Basics and Beyond which Debbie has recently recommended on her blog (the Kindle version is extremely reasonably priced). Written by Emily Aulicino, who will be one of the speakers in the DNA Workshop at Who Do You think You Are? Live later this month, it covers an awful lot of ground - there are even chapters on practical matters such as "Convincing a Person to Test" and "What to Do When Test Results Arrive". There's a new two-part ITV documentary series that you might find interesting - it begins at 9pm on Tuesday 4th February, and is all about Britain's most famous register office, Westminster Register Office (based at Old Marylebone Town Hall). You'll find the official press release here - I'll be watching in the hope that there are some behind the scenes shots that provide insight into the way that these portals of the registration system operate. In the last newsletter I described how, with a little help from me, one LostCousins member who was trying to identify 3 siblings who died as infants without ever appearing on a census succeeded in reducing 456 possible births down to just 4. The main aim of the article was to demonstrate how it's possible to take what initially seems to be a big problem and, by using simple logical steps, turn it into a small problem. It's a challenge we're continually faced with as we research our family trees, whether we're looking for births, deaths, baptisms or (perhaps most difficult of all) trying to identify the father of an illegitimate child. All too often we simply give up. I hope that having read that article you'll be inspired to have another crack at some of the problems you might have put on one side in the past - as Jennie did when she read the article. Jennie managed to whittle down a long list of possibles to just one, and sent off for the birth certificate - then a couple of days ago she wrote to tell me it was indeed the right child! The long-awaited British Library collection of records related to British India has at last arrived at findmypast (we were hoping to see the records last year). Records include births, baptisms, marriages, burials, plus probate and pension records - some of which relate to other locations administered by the India office (Aden, Burma, Kuwait, St Helena). "As far as I can see the website represents the first stages of a project to digitise national archives held in regional offices in large towns. The archives that I have found in my searches so far relate to the inter-war years and WW2. To date they appear to have digitised archives from 7 towns, there are probably 50 more of similar size. Although they say that they focus on register information, which I had assumed meant births, deaths and marriages, the only entry for my family relates to the employment of my uncle as a doctor by Poznan Town Council (Poznan is one of the towns whose archives have been digitised). Tens if not hundreds of people with my surname were born, married and died in Poland over the period in question, but there appears to be no trace of them in the digital records as yet. registers covered a range of other information, in particular local authority staff records and records of financial transactions and property transfers." It certainly sounds as if there's some way to go - but if you have Polish connections why not try the site out and let me know if you find anything of interest? When you join the Society of Genealogists there's normally a £10 joining fee to be paid on top of the normal annual subscription - but if you go along to Stand 920 at Who Do You Think You Are? Live this year you'll be able to join without paying the £10 joining fee. 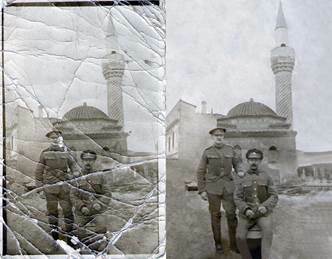 I'm told that it's possible to remove marks from photos using white bread - but when you can get an expert to carry out a digital repair, why take the risk? I've reduced the size but I'm sure you can still get a pretty good idea of the excellent job that has been done. The picture, by the way, is of Ann's grandfather with a colleague. Hundreds of members took up the astounding offer in my last newsletter, but so far only a small number have claimed the free LostCousins subscription to which they are entitled. Full details were given here - don't miss out! The Daily Telegraph has a collection of 15 photos of London's "secret historical treasures", including the smallest police station I've ever seen - sited in Trafalgar Square it was created from a hollowed-out lamp post and only has sufficient room for one person! When Janet looked at the 1927-2013 film that I mentioned in my last newsletter she noticed a familiar face - her friend's daughter Rosie and her boyfriend are in the modern shot of Petticoat Lane (she's the girl with red hair). We tend to think of traffic and the associated accidents as a modern phenomenon, but when I was flicking through the Illustrated London News for 27th February 1869 I came across a most interesting article. 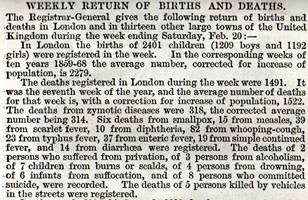 In those days the Registrar General would publish weekly figures for births, marriages, and deaths in London and several other large towns. The figures for London were further broken down to show deaths from certain diseases and other causes, including the number of people killed by vehicles in the street - which amounted to 5 in the week ended 20th February 1869. Since, on average, there were only 2.56 deaths per week on the roads of Greater London in 2012, even though we have progressed (if that's the right word) from horse-drawn to motorised transportation in the past 145 years, I wondered whether the number of deaths in that particular week of 1869 was exceptional. This took a little investigation, because the Annual Reports of the Registrar General do not give the figures for road deaths in London, but in the British Newspapers collection at findmypast I discovered an article in another London paper, The Standard, which on 18th February 1869 gave the figures for the previous year - these averaged 23 fatalities per 6 weeks, or 3.75 per week. Of course, the fact that there were more fatal accidents on the roads of London in the late 19th century doesn't mean there were more accidents then - there's been an enormous improvement in the availability and quality of emergency medical care, and I except that many of those who perished in 1869 would have survived with modern treatment. But the very concept of road deaths in the days when the carriages weren't horseless was one that took me a while to get used to. It was also somewhat sobering to note the 15 deaths from measles, and the 39 from scarlet fever - both diseases I myself contracted as a child. Nowadays these diseases are a thing of the past in most developed nations - or at least they would be, were it not for a gullible minority who fall for unsubstantiated scare stories. Note: many thanks to Norma who very kindly sent me to 1869 issues of the Illustrated London News - I'm sure they'll inspire other articles in the future! I suspect the reason Norma sent me those newspapers is because she knows that I collect all sorts of ephemera - and why not, because you never know what serendipitous discoveries might be awaiting? 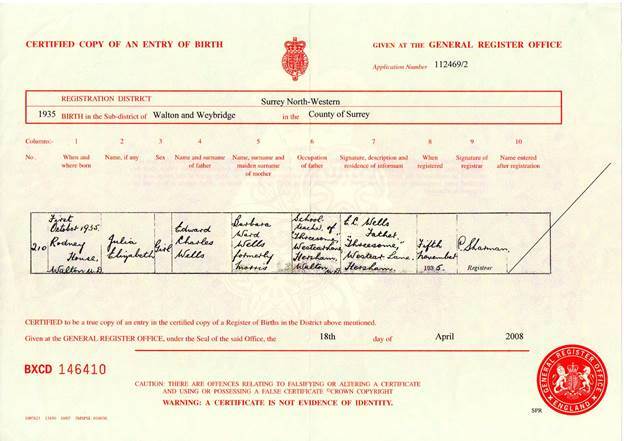 For example, nearly six years ago I ordered a copy of the birth certificate for one Julia Elizabeth Andrews - better known as Julie Andrews - after discovering that her original surname was Wells, which was also my mother's maiden name. There might just have been a connection, but there wasn't (apart from the fact that we share a birthday) so I filed it away. Then, last October I mentioned Julie Andrews in my tips column, and commented that I had a copy of her birth certificate. This prompted Jean to tell me that her father had been the deputy head at Moor Lane School where Ted Wells was a teacher and his daughter a pupil. Not only that, Petula Clark also went to the same school - and Jean's mother had taught her mathematics. Jean's mother also remembered that during the war Petula - who was just under 7 when war broke out - would entertain everyone in the bomb shelter with her singing. There will be more articles inspired by the ephemera in my collection in future newsletters. Question of the month: "Can a minor be an executor?" Clive asked a great question last month: "Can a minor be an executor"? This simple question was crucially important to his research, because if a minor cannot act as an executor then Clive and his cousins are almost certainly tracing the wrong ancestral line. My initial reaction was that this wouldn't be possible, since a minor is (in most circumstances) unable to enter into a legally-binding contract, but I always like to back up my answers with research, just to make sure. After much Googling I found that whilst a minor can be named as executor when the will is drafted, if that person is still a minor when the time comes to prove the will then another executor would have to act. In the event that the minor was the only executor appointed then it would be up to the minor's legal guardian to take on the role. Note: the age of majority was 21 in England & Wales until 1970, when it was reduced to 18 by the Family Law Reform Act 1969. I've just finished reading The Westbrook Affair, written by LostCousins member Alan Dance, and whilst it's more of an historical novel than a genealogical mystery, I couldn't wait to find out what happened at the end! Alan has cleverly woven real historical events into the story. Until a few days ago I had never heard of the Great Sheffield Flood of 1864, but this tragic event - which claimed the lives of 250 ordinary people - really comes to life in the book. Note: the day after finishing the book I opened the latest issue of Your Family Tree (March 2014) to discover an extensive article about the Great Sheffield Flood, written by a family historian who discovered that two of her ancestors perished that fateful day. What a coincidence! I don't normally read historical novels - they tend to be set in the 17th and 18th centuries and revolve around the lives of a handful of privileged people, which makes it hard for me to relate to the characters. But because The Westbrook Affair is set in the 19th century and, in the main, about ordinary hard-working people I found it much more involving - even though it is set in a part of England that I'm not particularly familiar with. Available either as a conventional paperback or in Kindle format, The Westbrook Affair is Alan Dance's third novel and his fourth book - but I certainly hope it isn't the last Dance! Note: Denise wrote to tell me that her friends' mother has just published her first book, a novel based on a true story, at the age of 83! I haven't read it but the reviews from people who have are very complimentary - you can see them here. Last year I wrote at length about the dangers of using a Yahoo or Yahoo-managed email address - and there seems to have been another major surge in hijackings judging from the number of spam emails I've received recently purportedly from LostCousins members. "Nearly 600 people worldwide received a begging email to help me stranded in the Ukraine. That was bad enough but worse was to follow, my address book was now devoid of all entries and my stored e mails, probably in excess of 40,000, many from family historians where email was my sole contact had also been cleared. The Yahoo restoration team temporarily suspended all incoming and outgoing mail to conduct a forensic examination of my account. That was concluded on 23 January and I now have all of my email address book and the thousands of e mails in my stored folders." Ultimately he was extremely fortunate in that most, perhaps all, of his data was recovered - but he had a worrying time. I too have a BT email address, but there are no names in my address book, nor are there any emails that can be deleted - they're all stored on my own computer (and, of course, I have numerous copies elsewhere). I can't guarantee that my own email account won't be hacked, but even if they succeed they won't gain anything, nor will they be able to email my friends and relatives. If you really must use an online email service my advice is to use Gmail - it's free and seems to be far more secure than Yahoo. Finally, don’t assume that just because you have a virus-checker or an Internet security program that your email account is safe - it isn't! My wife and I live in a part of the country where the water is very hard - so our electric kettle quickly collects limescale. Brand-name descaling agents are expensive; citric acid is a bit cheaper but can be hard to find; vinegar is cheaper but smelly; lemon juice has a beautiful fragrance, but it's expensive. Whatever you use you end up wasting at least 2 kettle-fulls of boiling water at the end. My solution is cheap, quick, and easy. I use a sponge pan cleaner (35p for 10) to remove the limescale - it might not remove 100% of it, but it removes sufficient to restore the kettle to full efficiency. When I've finished I wash the kettle out with a little cold water (no wasted electricity) and it’s ready to use - quick, simple, and virtually costless! I've just booked my car for the Genealogy in the Sunshine course - I decided to upgrade to a bigger car than usual (a Ford Focus), in case I need to ferry people around, but it's only costing me £5 a day. Sounds unbelievable? Get your own quote here. Wednesday 5th: although I haven't watched it yet, I'm reliably informed that last night's documentary was disappointing. Hopefully the two-parter which begins on BBC2 tonight will be better! Thanks for taking the time to read my newsletter - I hope you find some of the articles and tips useful. And if you do, don't tell me - tell the other researchers you're in contact with, and invite them to register free so that they get their own copy (and find some new cousins of their own)!